With nearly 2,000 people registered, our previous presentation of this webinar broke attendance records. Due to popular demand, we’ve now added a second date for this webinar. Mark your calendar for Aug. 3 so you won’t miss it! 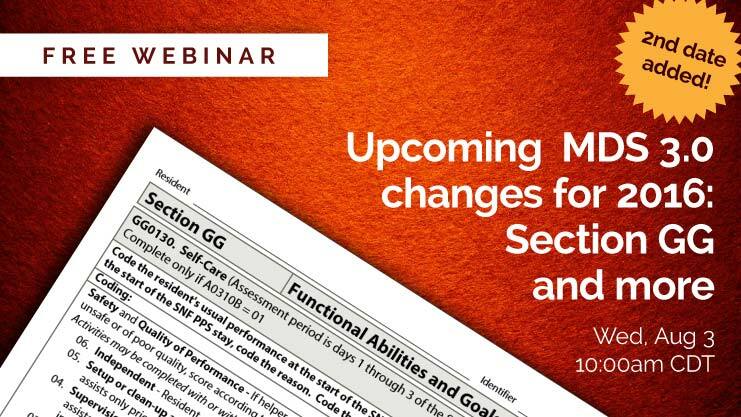 This free one-hour webinar will cover the upcoming Oct. 1 changes to the MDS 3.0 process, including Section GG, which is designed to help your facility assess the functional ability of skilled residents at the time of admission, establish discharge goals, and review those goals at discharge. Also addressed will be the New Part A Discharge assessment and other updates to the RAI Manual and MDS 3.0 coding. Space is limited and our last webinar filled up fast. To ensure your place, register now by clicking the button below. When are the slides going to be available? Thank you for repeating this course. Thanks, Teresa! I’m glad we could arrange to offer it a second time. Hope you find it helpful. August 3rd is not a Thursday, it is a Wednesday. Which day is this seminar being held? Good catch, Sally! We’ve corrected the typo. The webinar is Wed., Aug. 3. In preparation for Aug 3 webinar, is there an ability to make copies o the preparation prior to the webinar? Hi Stephanie — Unfortunately, we won’t have the slides available until the morning of the webinar. We will post them as early as possible on the day of the webinar on this page. Was this webinar recorded for others to view at a later time? Hi Jesica — yes, you can find the recording/slides on this page.